This week on our Etsy Shop Makeover series, we are going to talk about you…that’s right, you. We are going to talk about what you need in your About Page, Shop Announcement, and Your Public Profile. So are you ready to talk about you and nothing but you today? I hope so … let’s get started! The first thing that you have to do before you even think of opening your Etsy store is to believe in yourself! Period. Believe. In. Yourself. If you believe in yourself, then others will believe in you. If you believe in yourself, then others will believe in your product. That is the plain and simple truth. The picture at right is me. I might not like myself every day, there might be things that I think need changing … did I mention I still want to lose 20 more pounds and I love food … but the bottom line is that 95% of the time, I believe in myself. My Dad whom I admire, love, and respect taught me the Value of Believing in myself from a very young age. As a child and definitely as a teen, I lacked self-confidence. My Dad and Mom bought me this book as a kid, The Value of Believing In Yourself. It’s the story of Lois Pasteur and how he found the cure for rabies, but not without consequences. You have to market not only your product, but also yourself. Who wants to buy from someone who doesn’t like themselves? You must be confident in what you have, what you offer, and what you sell. So how do you communicate this? Through your social media channels, website, and blog … allow people to know who you really are. People want to be inspired and uplifted and you and your handmade items can do that, you just have to believe in yourself. What do you mean you don’t have an About Page? I just went to the front page of Etsy and over half of the stores I went to did not have an About Page. I am stunned. WOW! If you do not have your About Page set up, you need to do this…today. Don’t wait any longer! You are missing out on valuable meet-and-greet time with your potential customers. Perhaps offer a teaser graphic that matches your logos and branding that also offers them a discount. Perhaps a close up of a few of your creations (in collage style maybe)…but please do not clutter your photos! First tell who you are and a bit about your story. Tell why you make your handmade item. Write how you found your chosen medium, why you love it, etc. Tell the purpose for your store. This is the hardest part for any artist. Why do you have a store? To make money? Yes. But there’s got to be more than that. Your store must have a focus and a point to it … or it’s just another store on Etsy. Maybe you sell fabric earrings, your purpose could be to “Bring texture to your ears.” Be creative, but have a purpose. Tell briefly what kind of services you offer and how they work. For example “I create custom bracelets for bridesmaids, tailored to outfit any kind of lady on your special day.” Tell if you take custom orders, ship free, offer coupons for mass purchase, offer wholesale prices, etc. Need more inspiration, check out this awesome About Page by DellCoveSpices. Your shop announcement is what Google sees when people look for you or for a handmade item. Plain and simple, your shop announcement needs to be short and key word rich without looking “key word rich.” This section is 100% about reaching your customers, and being SEO smart. Yes, there is a reason that Etsy gives you a Google preview of your store’s listing for Google search. You should be happy about this, so make it work for you. While customers love getting your coupons, if you put your coupon first in your shop announcement you lessen the chances of Google picking up your store! Why would you want to do this? The argument has been made that many people shop Etsy and want a discount, while this is true, let’s look at it from another point of view. If you want an online deal, where do you shop? Most likely eBay or Amazon, right? Not Etsy. People come to Etsy looking for quality handmade items and vintage items. It’s okay to put your coupon last in your shop announcement. The argument for seller’s who are against that is that people won’t see it to use it. I agree, but if you feel that badly about it, once they are paid, simply send them the value of the coupon that they would have saved if they would have used it. You may have just earned yourself a repeat customer for being nice, friendly, and honest with them! Now I’m going to use the next 70 characters to write an SEO dense description that Google will love and will (hopefully) get me found: “Polymer clay figurines & sculptures that inspire joy, laughter, & a smile. Where handmade items come to life! Parker, Lolly, & other characters too.” Obviously your shop announcement is longer than this, you can add more after this, but your first 70 characters are the ones that count for Google, so use them wisely! There is a difference between your public profile and your about page…though it is small! 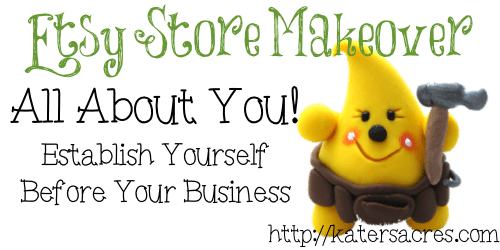 Your public profile includes you avatar (which we will talk about with Kelly J Sorenson when we discuss branding), details about you such as age, gender, location, a mini about section, and what you want shown on this page from teams, treasuries, your store, and favorites. Here’s the big difference…where your About Page is all about you and who you are … your public profile is more about your store than you. It’s a small difference and many of those things on your About Page may actually overlap in this about section of your public profile. (If you are confused, log into your Etsy account and check out the difference). Use this section to share a few product testimonials, include newsletter links, and information about what people will find inside your store. 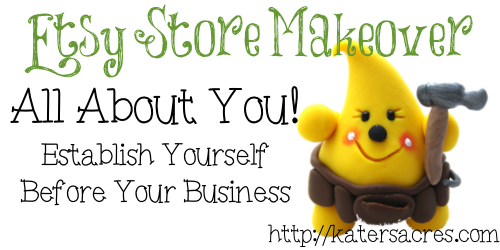 I hope that you are knee-deep in giving your Etsy store a Shop Makeover. 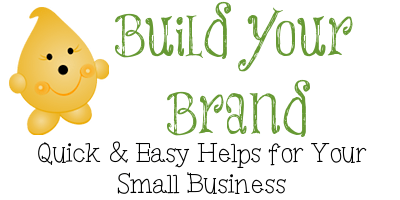 Don’t forget to sign up to receive the Build Your Brand newsletter for more valuable information! Another great bit of advice. I’ve struggled in the past with “selling myself”, so this post really hits home for me. I off to check my announcement and about me page…. Great article and very key information. Thank you so much for the clarity, it helps immensely. I have shared this article through my Newsletter so here’s to you and bringing in new visitors who can benefit from this also. A very Happy New Year to you! Katie, as always, thank you! I know I need to write my about page, but sometimes it’s enough to get my deadlines completed in a day’s time. I think I just need to add this to my to do list! Thanks for the information, Katie. Katie, I so love your posts and that you’ve found your Parker world. Thanks for sharing. I really enjoyed doing our About page – and I’ll definitely revisit the SEO in our shop announcement. Thank you for the reminder! Hey, when you get a minute, can you email me that information about the multimedia course/program you took? Thank you, Katie, for such great information. I have some work to do! Great Tips! I plan to put these into action right away! Very thought provoking as always Katie… made some changes to mine! What great advice, I’m going to re-check my shop! and give it some tweaks!